Before you read this rather long document, if you already know about Painter’s Brush File Structure, you may want to skip to the bottom part, How Does Painter 12.1 Fit In. Also, you may want to know that I have converted the complete document to a PDF which is available for you to download. In this document, I hope to explain a bit about Painter Brushes and how they work in Painter. I will talk about setting up brush libraries and how to install brushes. I have previously provided a video, Brush Libraries and Installing Brushes, but it was based on the original release of Painter 12 and Painter 12 with the SP-1 Patch. If you have upgraded to Painter 12.1, and you should, you will find that brush management has changed drastically and is vastly improved. I know, strong words, and I truly believe they are the best descriptors for the new way to manage your brushes. If you decide to stay with the earlier versions of Painter 12, I believe this document will help explain brushes for you, too. To get started, we need to understand where Painter saves its default brushes and where it saves any customization that you make to your brushes. Painter uses two different places to store information about brushes. When you install Painter, it places its default brushes into an area that I call the Application Area or Path. I am not sure if this is a standard term or not, but it works to help keep the two paths Painter uses separate in my mind. After installation, if you make any changes to a brush, Painter places that information into the User Area or Path. In both places the names of the files are the same, which is why it becomes confusing. Let’s take a look at each. Go to your start menu and open Control Panel. Select Show Hidden Files, Folders and Drivers. Select OK and you will be able to see your hidden drives. Go to you Finder Menu Bar and select Go > Go to Folder > in the dialog box that opens write ~/Library; then click go and that will show hidden folders. Now you can follow the first path described and select Application Support > Corel > Painter 12 > Default or Workspace name > Brushes > Painter 12 Brushes. I am also told that if you right-click on the Corel Folder and select Make Alias from the drop down menu, you can then drag the Alias to your sidebar on the left under Favorites. That will allow you to go directly to the Corel Folder without having to open your hidden files every time. If these instructions do not work, it would be best to contact MAC Support. In all four User Paths, we end with a library called Painter 12 Brushes, which is the same name of the library in the Applications Path. Both Painter 12 Brushes folders are Painter’s default libraries. Why do we need two libraries with the same name? How does each library function? Could we make this any more confusing? You betcha! A brush library is simply a folder that contains brush categories and companion JPEGs. Interestingly, Painter 12 Brush library is placed in the Application Path when Painter is first installed and that is the last time Painter will write brush information to the Application Area. From this point on, Painter will only write to the libraries in the User Area. That is correct, the Application Area is considered a protected area and the program will not write or save any brushes in the Application Area. Instead it saves new information about variants to the User Area. In other words, once you use a variant and change something as simple as the size of the brush, Painter holds that information in memory, and when you close Painter the information is stored in the User Area in the duplicate library and the duplicate brush category. Specifically, if you change the size of Acrylic > Bristle Brush, Painter holds this information in memory until you close Painter. At that time it writes a file in Your User Path…Painter 12 Brushes(Painter’s Default Library) > Acrylics (Brush Category Folder), that looks like this c_bristlebrush.xml. OK, drum roll please, here is what actually happens when you want to use the Acrylic > Bristle Brush. The program first looks in the User Area for c_bristlebrush.xml. If one is found, all the necessary information to construct the brush is located in the XML file including the changes you made to the brush when you last used it. But if there isn’t a c_bristlebrush.xml, then Painter follows the Application Path and finds the default setting for the brush and constructs the brush variant accordingly. To recap, Painter writes all change information to the User Path and looks there first for the necessary information to build the brush, but if it isn’t found, Painter looks to the Application area for the information. Painter writes and looks for the change information automatically; you don’t have to do anything to help. But there is more information we need to process. I have mentioned Brush Libraries and XML files, and I have talked about brush category folders among other things. So what are Brush Categories, Brush Variants, and Companion JPEGs? At this point, we know that Brush Categories live inside of the Brush Library folder. We find Brush Variants inside of Brush Categories. In both the Applications Path and the User Path we have Brushes > Brush Library folder > Brush Category folder > Brush Variant files. I like to think of the Brush folder as a city. Inside the city we have Libraries (Brush Libraries); inside the Library we have Stacks (Brush Category); inside a Stack are Books (Brush Variants). Along with Brush Categories, I have mentioned Companion JPEGs. These can be found in the Brush Library, too: Brushes > Brush Library Folder > Companion.jpg file. If you can remember the last time you were in a library (it has been years for me), you may remember that at the end of each stack is an identification plate that tells you what is located in the stack. That is the job of the Companion JPEG. Painter looks for the Companion JPEG and uses it for the Icon on the Brush Selector Bar to identify the Brush Category. Without that JPEG, the Brush Category cannot be displayed. OK, we know what the Companion JPEG is for, but what about the Brush Category folder; what does it do? The Brush Category Folder, or as I have called it, the stack, contains all the brush variant information, or in my metaphor, all the books. For the moment, let’s limit the conversation to just the Default Brush Categories found under Painter 12 Brushes in the Application Area. Remember, these are the ones written at the time of installation and never changed. Each Brush Category has 3 or 4 files that concern a particular variant. The files are NIB, STK, JPEG, and XML files. Specifically NIB files concern the nib shape of the brush variant; STK files are about the stroke; JPEG files create the dab; XML files contain all the information required to construct the brush. XML files are by far the most important because the information in the other three files is contained in the XML file, too. If I wanted to share a brush variant with you, all I need to give you is the XML file. All you need to do is place the XML file into the Brush Category of your choice and voilà, it will appear in that category the next time you open painter. However, it will not show the stoke it creates in the Stroke Preview box or the nib type, etc. Guess what, if you go to Brushes > Save Variant and save the variant as itself, then the NIB, STK, and JEPG files will be written from the XML file and the Stroke Preview, etc. will be populated. It is important to note, that only Dab Types that are captured will have a JPEG file. All other variants will have a NIB, STK, and XML file only. We have been talking about what is in the Default Brush Library and the Brush Category in the Application Path. What about the same named files in the User Path? There are differences. First, the Default Brush Library in the User Path contains Brush Categories but no JPEGs. And second, the Brush Categories contain only c_brushname.xml files, the change files we mentioned earlier. Remember this is the User Area and Painter writes the changes we make here. There is no need to have the Companion JPEGs here because they are in the Default Library in the Application area. Again, Painter first looks at the User Area to build the brush; if it needs more information, it looks at the Application Area. So far, we discussed default Libraries, Categories, and Variants. Do custom Library, Category and Variants work the same as default ones? Get ready; here it comes: Yes and No. You didn’t think it would be a simple yes or no did you? Is There a Difference between Default and Custom Libraries, Categories, and Variants? The default library, categories, and variants are included and installed by Painter in the Application Area regardless of operating system. Custom libraries, categories, and variants created by the user are placed by Painter into the User Area. Is that all there is to it? Yes, that is about it, at least as far as Painter is concerned. Painter installs default brush stuff into the Application Area, or if the user makes some brush stuff, Painter places it into the User Area. However, if the user has administrative rights, which allows s/he access to the Application Area, then the user can also place brush stuff in the Application Area. What? OK, let’s consider what we did before Painter 12.1. We could make brush stuff like capture a category and save a variant using Painter. But if we wanted to install a brush set made by someone else, we had to follow the Application Path or the User Path and place the Brush Category Folder and the Companion JPEG in the proper folder. This seemingly simple task tripped many users and caused many headaches. With Painter 12.1, everything got so much easier. More about that later, let’s continue talking about all this brush stuff prior to 12.1. Painter’s choices are fixed; it installs default stuff to the Application area and custom stuff to the User area, but the user can pretty much do what s/he pleases including totally screwing up Painter by making unfortunate choices. Over the past few years, I have looked at many folk’s file structures and, trust me, been flabbergasted. I have seen RIFF file paintings, PDFs, PSDs, and as the document title implies, videos, to name a few, inside of brush category folders or brush libraries in both the Application Area and User Area. Oh stop snickering; I have seen this phenomenon with the most experienced users, too. Accidents can happen and for the most part none of us need to be messing around in Painter’s guts in my opinion. Prior to 12.1, we didn’t have a choice; we had to mess around with Painter’s guts. To install custom brushes from someone else, we had to place them in one of the paths described, but which one? Which is best indeed? This argument has raged for years among those who care, and I am not one of those who care. Well, maybe I care just a bit; I did write this epistle didn’t I? Both areas have their pros and cons. But the most important element to consider is how Painter looks at both areas. At this point I need to interject a new term, Workspace. When you open Painter, the stuff that you see, document window, tool box, panels, custom palettes, etc., comprises the workspace. When you open Painter the very first time, you open the factory default workspace. As you add custom palettes or open certain panels or arrange the stuff on the workspace, Painter remembers the changes and opens the workspace as it appeared the last time you closed. You are still working in the Default workspace, but it is a customized default workspace. If you have to re-install painter, or use a Shift-Start, you will lose the changes to the customized default workspace and be returned to the factory default workspace. Bummer! In the Export Window, navigate to where you want to save the workspace, name the workspace and select save. The workspace is saved and renamed in Painter. If you need to install Painter again, or do a Shift-Start to the factory default, all your need to do to get your workspace back is to import your saved workspace. All your custom stuff will return with the workspace. One caveat, you only get back data from the saved date. In other words, if you exported your workspace once and several months later you need to import it…all the custom stuff made during those several months will be lost. It is a very good idea to save your workspace frequently or at least every time you make any significant custom additions. I know, I hear you…what does this have to do with brushes. 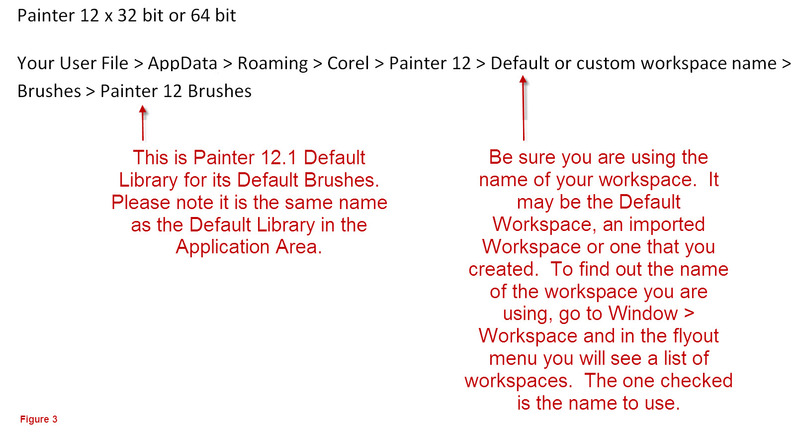 Remember in the User Path, a section reads like this: Corel > Painter 12 > Default or the name of your workspace > Brushes. In the User Path, the workspace comes before any of the custom stuff, which means that the custom stuff is workspace specific. If I make a custom Brush Category in Workspace 1, it will not show up in Workspace 2…or any other workspace I have for that matter. However, if the custom brush category is placed in the Application Area, it will be available in all workspaces. And probably of more interest, this custom brush information is not replaced when you reinstall Painter or do a Shift-Start. It appears that the Application Area would be the best choice, but hold on; I do not think it is the best solution. I think you need to make a custom workspace and save it frequently. After all, you do want to save your other custom stuff from reinstallation or Shift-Start. Plus, custom brush stuff I make with Painter will be written to the User area anyway. If I want to keep it in the Application area, I will need to move the new information from the user area to the application area daily or often. It would be a nightmare to keep up with this stuff. It is simpler to follow Painter’s lead and leave the Application area as a read only area and use the User area for custom stuff. Besides, with Painter 12.1 passing brushes around will be so much easier. Once again I hear you grumbling. I know, I had that video showing how to load brushes into Painter 12 and I told you to load them into the Application Area. The devil made me do it; honest. Seriously, there was a bug in the first version of Painter 12 that wouldn’t allow you to place brush libraries in the User Area. So we had to use the Application area until the Developers fixed the problem. By the way, their solution is beautiful and elegant…more on that later. Learned what a Brush Library, Brush Category, and a Companion JPEG are and how they are used. Discovered the difference between Default Libraries, Brush Categories and Companion JPEGs and Custom Libraries, Brush Categories, and Companion JPEGs. Decided that installing brushes into the User Area was best. OK…I decided that, but it is the right decision. Basically, you can still manually install brushes into painter 12.1 the same way you have always installed brushes in previous versions. You still have a choice to manually install them in the Application area or the User area. But with Painter 12.1, you also have the option to automatically install them, which is so easy and a vast improvement over the manual way. There is one caveat, if we are talking about older brushes, let’s say my Cool Spring set of brushes, then I or someone has to manually install them into painter. Once done, I can export them as a brush category and provide anyone with that file. The file will look like this Cool Spring.brushcategory. Going forward, brush variants, brush categories and brush libraries created in Painter 12.1 will be exported as a single file. In a very short while, all custom brush stuff will be handled this way without ever going into Painter’s file structure. It is a grand new day. Let’s say I have my Cool Spring brushes in a separate library named Skip’s Cool Spring. There could be more than one brush category in the library, but for simplicity, let’s just have the Cool Spring Brush Category and the Companion JPEG inside of the library Skip’s Cool Spring. In the Choose Brush Library window pop-up, I would choose Skip’s Cool Spring Library from the drop down list and click OK.
A navigation window opens and at that point, I can actually change the name of the library to something else. But let’s say I leave it as Skip’s Cool Spring and I navigate to some place on my computer to save the exported file. I have a folder in my Documents called Custom Painter Stuff. In that folder I have many sub folders, for example, I have one called Exported Painter Libraries. I would export Skip’s Cool Spring to that folder. The file will be called Skip’s Cool Spring.brushlibrary. Most of the files are very small, but some are large. Next I want to send you the file. I can do this anyway I wish. If it is a particularly large file, I may want to zip it first. Save the file to a special place on your computer, like my Custom Painter Stuff folder. Just make sure it is an easy place that you can remember. Not being able to find the file is a common occurrence. If the file was zipped; unzip it. An import brush library navigation window will open. Go to where you save Skip’s Cool Spring.brushlibrary file and select it and click OK.
And here is an easier alternative way. Just save Skip’s Cool Spring.brushlibrary unzipped on your desktop. With Painter open, simply double-click the file and it will automatically install in Painter 12.1. Very easy and very cool and no need to go through Painter’s menu system. In Painter, make sure the Brush Library that holds the category that you want to export is active. When the Export Category Navigation Window opens, navigate to where you want to export the file and click OK. The file created will be Cool Spring.brushcategory, and like with a Brush Library, you can change the name of the category. Next I send you the created file…if too large, I zip it, but it shouldn’t be too large. And if you want to import the Brush Category, this is what you do. Save the file to a special place on your computer or drop it on your desktop. Open Painter and make sure the library where you want to save the category is open or active. Go to Brushes > Import > Category and in the navigation window find the file you saved, select it, and say ok. The Category will be automatically installed in the current Library. And as before, you can simply double-click the file and it will open in the current library without you going through Brushes > Import > Category. Can you believe this…it is so easy…thank you bunches Corel Painter Developers. First I would make sure the brush I want to export is the current brush showing in the Brush Selector. Go to Brushes > Export > Brush and like brush library and category, I navigate to where I want to save the single variant and click OK. The file name will be Name.brushvariant where Name is the name of the variant. Open Painter and make sure the library or the brush category you want to use is currently active. Next to the drop down menu is a plus sign. If we click the plus sign a new brush category window opens and we can create a new category for the variant. Add a new name and click OK. The new name is now showing in the category drop down list. Click ok and the new category will be created with the new brush variant inside. Painter uses a default icon for the category, but you can change that later. Alternately, you can double click the brush variant file and it will automatically be loaded into the currently active category. You do not get a chance to create a new brush category. I don’t have any more to say. Are you glad? Well I am glad to be through with the umpteenth draft. I hope this tome will be helpful to you. I have to admit, I am hoping that I can reference this document whenever I have a brush loading question. Hi Skip, thanks so very much for this tutorial! I upgraded to 12.0 some months ago, followed your advice about installing brushes in the applications area. Upgraded to 12.1, leaving brushes where they were and now decided it was time to clean up and install brushes correctly. I’ve spent a good amount of time saving, moving and reinstalling brushes to the User area (I’m on a iMac using Snow Leopard) but I still don’t have the setup correct. I did carefully study the earlier video several times but still had questions about the 12.1 setup. I’ll spend time carefully reading through your material in hopes that it will answer my remaining questions and perhaps resolve a couple of problems still bothering my setup. One point of confusion you might be able to clear up: There’s two folders; Painter, and Painter 12. Which contains (or should) contain the original Painter brushes, and which should contain the custom brushes? I believe one of those folders should contain all the individual brushes with each Category in a separate folder, but which folder? The other should also contain each individual brush and Category but is reserved for Variants the user makes to a given brush. At least I’ve made some progress but still not quite right so I’ll continue to work until it’s correct. Can I contact you for a bit of advice (if, after reading and working through the tutorial material) if I’m still stumped? Sounds like you might have the new computer operational — sure hope so. I am away from my computer at the moment. As soon as I get home I will give you a better answer. Painter 12 brushes and Painter Brushes are the default libraries. Painter 12 Brushes holds painter 12 brushes and painter brushes holds painter 11 Brushes…at least in the file structure. Inside of th program the names change to painter 11 brushes for painter 11 and painter brushes are for painter 12. I would not use either for custom categories. I will explain better when I get home. I have a little more time to explain the two default libraries in Painter. If you are looking in the Program, at the Brush Library Panel and select Brush Library you will see at least two libraries…or more if you have made some. The two libraries are called Painter Brushes and Painter 11 Brushes. Why are there two libraries? Well, when Painter 12 came along, some folks wanted to reduce the number of brushes in the default set, especially redundant brushes that only had size changes. For instance in Painter 11 we had Acrylic > Dry Brush 10, Acrylic > Dry Brush 20, and Acrylic > Dry brush 30. Three variants, but the only difference between the three is the size of the brush, one at 10, one at 20 and one at 30. Most of us know how to change the size of the brush, so the developers dropped all the duplicate brushes and left only one for Painter 12. In Painter 11 some categories seemed to overlap, so to make things more streamlined and easier to understand, Artist Oils and a few other categories, were dropped, but their variants were not dropped. They were added to other Categories like Acrylics or Oils. There were 900 plus brushes in Painter 11, but once the consolidation was finished, there were 700 plus brushes in Painter 12. Please understand…no brushes were lost…just reduced to one of each and moved around to make a better fit. But some folks wanted to be able to access brushes the same way they had in Painter 11. Easy enough, the developers just placed the Painter 11 brushes into its own library. So, if you can’t find a brush in the Painter Brushes library that you used to use in Painter 12, then switch to the Painter 11 Brushes and you will find the “missing” variant. Both libraries have Brush Categories and their companion JPEGs. Ok…read the PDF and see if it makes sense; I think it will all come together after that. I didn’t mention custom categories and brushes because I am hoping the PDF will explain all that. Hi Skip, video was great. I will download PDF and read that also. I really appreciate the time you have taken to explain in detail to all of us, the new things you can do in 12.1 brush management. See you soon in one of your classes. You are welcome Pat. Looking forward to seeing you in a class. So glad you are finding them helpful. If I can help in anyway, please feel free to ask. Thank you so much for this PDF. It’s very clear… except for two issues . 1) On page 9 : The double-click on the file give me a message that Safari cannot open it. 2) I woul like to create a new library call “Skip’s Brushes” an place in it all your brushes as categories. Is it possible to do that? If so, how? I wish I could write this in French. Your English is amazing! 1. If I remember correctly, you are using a MAC. I don’t know how to tell you to do this, but in a PC each file extension is associated with a program to open it. I couldn’t find a reference on page 9, but I am assuming you are talking about double clicking on a file with the extension of .brushcategory or .brushlibrary. If so, be sure Painter is open when you try the double click and also double click from inside of your Finder. I am guessing that works the same as with the PC. If you still get the message that Safari cannot open the file, then you need to set Painter 12 as the default program to open the three file extensions. In a PC we would go to our Control Panel > Programs > Default Programs > Set Associations. You would change Safari to Painter 12. If you do not know how to do this in your MAC, remember you can go to Painter’s menu bar and go to Brushes > Import > library or category or variant. 2. Pierre, if you don’t mind the name of the library being something else, you could just go to my blog to one of my brush download pages…let’s say Cool Spring. Download the Cool Sping library option, not the category. Load Cool Spring Library into Painter. Now download all the other brushes as a category and make sure the Cool Spring Library is Active. All the brushes will be together in one library called Cool Spring. However, if you are set on the name then follow this path. A library is simply a folder placed after the Brushes folder in the user path. Look in the PDF and follow the User path to Brushes. Once you are there, create a new folder in the Brushes folder called Skip’s Brushes. Now you do have to place something in the library in order for Painter to use it. I would suggest looking in Painter 12 Brushes and copying the Acrylic folder and the Companion JPEG to Skip’s Brushes. You can delete it later. Now open Painter and in the Brush Library Panel fly out menu, select Skip’s Brushes. With the new library active, go to Brushes > Import > Category and select the one of the files that you downloaded and slick OK. It should come right into the library Skip’s brushes. Ok..now right click on the Acrylic folder and the Companion JPG and remove them from Skip’s Brushes. You should have a library set up for my brushes that work. 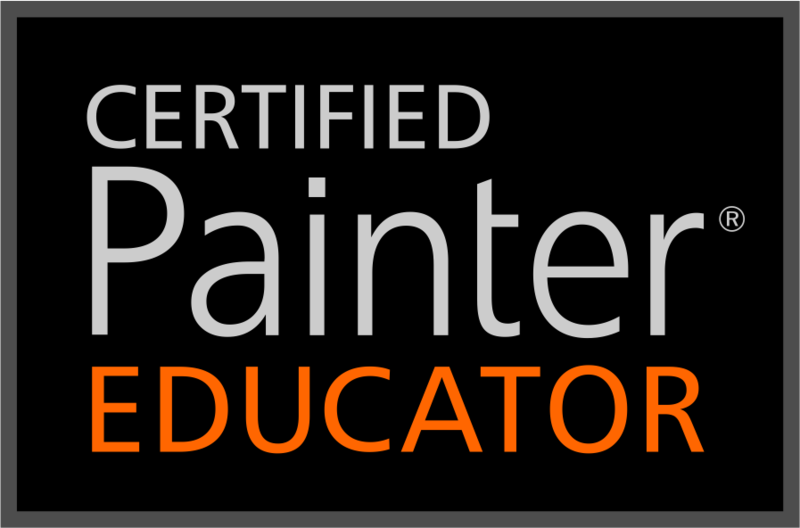 Thank you for this great information on Painter Brushes! As usual, you have made it a lot easier for me to understand some of the workings of this complex program. Now I know for sure you are the ‘Brush Whisperer’. Looking forward to your next class. Thanks bunches…not sure about that brush whispering thing…LOL. I like dogs and horses better than brushes. It is amazing how well you have analyzed and explained such a confusing issue! Thank you so much for the time that you have spent doing this! I really appreciate the comment. You are a doll! All good, excellent information. I’m still reading through the PDF material and looking at the Folders. I understand that if I export the Brush Library and/or Brush Categories, then delete the custom brushes (Lib or Cat) the close Painter 12.1, reopen it and import ( or double click on the item) the Brush Lib, or Cat. will be imported into Painter. And the imported Lib. or Cat. appears inside the ~/Users/rpartner/Library/Application Support/Corel/Painter 12/Default/Brushes/Painter 12 Brushes/… What I see when selecting the Painter Brushes from the Menu Bar is a list of all the default Painter 12 Brush Categories … and any custom brush categories that I have imported, and all brush variants seem to be intact. However when selecting the Brush Library from the Menu Bar then selecting the flyout menu icon at the right, then select Brush Library, all I see are two possible selections, Painter Brushes and Painter 11 Brushes. I would like to place the custom Brush Categories outside the main Painter 12 brush menu list. I’d like them to show up in the fly-out, Brush Library list, along with the Painter Brushes and Painter 11 Brushes. With Painter 12 I was able to set up ‘custom brushes’ so that their categories could appear either inside the default painter menu, or outside the default menu as a list of custom categories when selecting the fly-out menu. I’ve tried moving the custom brush categories to different locations inside the /Corel../…/ folders without success. So, just wondering it this approach is no longer possible with 12.1 or I simply just don’t know or understand the proper directory structure. Would a screen shot be at all helpful in understand what’s happening? I’ll keep working of the problem … right now ALL brush categories (custom and default) are in the one brush library potentially making for a very long list of brush categories. It would be nice to trim it down to just those one wishes to work with at a particular time. Thanks again for you Web information and the PDF, I’ve been a Windows and Mad user for many years so I do understand the diredtory structures but correct placement for the custom brushes seems to ellude me. You are confusing one part of the puzzle. The file with the extension .brushlibrary will automatically load in this path: ~/Users/rpartner/Library/Application Support/Corel/Painter 12/Default/Brushes/ The .brushcategory file will load in this path: ~/Users/rpartner/Library/Application Support/Corel/Painter 12/Default/Brushes/Painter 12 Brushes/. So if you want the categories in a separate library from Painter Brushes, then you have to use the file with the extension .brushlibrary from my blog. If you use all of them, then you will have 12 or so libraries show up in the Brush Library Panel fly out menu in Brush Library. I recommend having lots of libraries because that means you will be using less of your RAM loading the current library. But, if you want only one library, then import one of the library files and then import the categories into that library. But, it seems that you want to create the extra library from Painter Brushes. If I understand it correctly, you already have all your custom categories in Painter Brushes, the default library. If this is the case, then export Painter Brushes Library, but change its name when you go to save it. Then import it back into Painter 12.1 with its new name. This part is tedious, but necessary. Go in and remove all the categories you do not want in the library. Right click on the category and select remove category. Now you should have a new clean library with all your custom brushes. Take a look at what I wrote to Pierre in this same thread. I am pretty sure I give an alternate option in my reply or at least more information on the same subject. Skip, your generosity is even more amazing than my English! The first issue is solve. As for the second, your explanation how to proceed are clear water. However, I am wondering now if it will be memory consuming to place all your brushes in one library (Skip’s brushes). In my opinion it would be better to have a lot of libraries especially since most of my brushes are memory intensive watercolors. It really depends on the memory of your machine. If you are reaching the limits of your RAM, multiple libraries will help. Otherwise it doesn’t matter. I like having multiple libraries. Don’t forget to make a Library Custom Palette. Once you have your libraries made and brushes set, then you want to go to each library and holding the shift key down, drag at least one brush from each library…not category…but each library to your custom palette. Rename each icon for the name of the library and show text. Now anytime you want to switch between libraries, you can select one of the icons in the custom palette and you will change to that library. I like doing this because it means I do not need to go through the menu to get to a custom palette. Your opinion, Skip, is very relevant. I had already a libray custom palette. I added your brushes and those of Karen. I then saved my Workspace. I was very pleased to see my tulipes on Karen’s site. You should be pleased and proud; the tulips were gorgeous. You did very well in the class. Remember it was only 4 weeks long. Thank you again for all the helpful information, I’d still been trying to figure it all out days from now! See you at one of the upcoming courses … and thank you again so very much. That’s wonderful Robert! I’m so glad it is working for you now. Thank you so much for letting me know. I thought I had it set to never expire, but apparently I didn’t…or I have some problem at You Send It. The link should work now. About the Sargent Brush, it sounds like it is acting the way it should. Go to Edit > Preferences > Interface and change your Cursor Setting from Enhance Brush Ghost to Brush Ghost. That will return the cursor to a line. The Sargent Brush responds to pressure and will give you a thick or thin brush stroke. Thanks again for letting me know about the link. Glad to hear you are feeling better. Painting will help…at least it helps me keep my mind off being sick. I bet the portrait will be terrific. Glad you like the PDF and another big thank you for letting me know it had expired. I actually didn’t set it to never expire…so I guess it was only good for two weeks. I don’t know what we would do without Skip. This is SO HELPFUL! Thanks so very much! I want to thank you for the opportunity to load additional brushes for my Corel Painter12. For me, the work is new with a graphics tablet. Otherwise, I stand at the easel 🙂 Unfortunately there is no or very few tutorials in German. I wish I was fluent in German as well as other languages. I have had visitors from 145 countries; many use Google translate, but the videos cannot be translated by Google. I wish I could afford to have the videos translated. I know that Corel translates some videos that they produce in multiple languages. You might want to send them a request for more translations into German. I don’t know how well Google translates into German. I will translate this paragraph in German with Google; that should give you a good idea how well it does. Ich wünschte, ich war in der deutschen wie auch andere Sprachen fließend. Ich hatte Besucher aus 145 Ländern, viele Gebrauch Google übersetzen, aber die Videos können nicht von Google übersetzt werden. Ich wünschte ich könnte es sich leisten, haben die Videos übersetzt. Ich weiß, dass Corel einige Videos, die sie produzieren in mehreren Sprachen übersetzt. Vielleicht möchten Sie schicken sie eine Anfrage für weitere Übersetzungen ins Deutsche. Ich weiß nicht, wie gut Google übersetzt ins Deutsche. Ich werde dieses Absatzes in deutscher Sprache mit Google übersetzen; Das sollte Ihnen einen guten Eindruck, wie gut es tut. I’m relatively new to Painter. I’m very confused. I have downloaded brushes to install. They are in the nib, stk and xml format. I have copied their folders to the application area, they don’t show up, copied them ot the user area under brushes, they don’t show up. How the heck do I install these brushes? I apologize for taking so long to answer. I’m in the middle of a class right now and my time is limited. When using Painter 12.1 or later, you do not need to place the folders into the path. There is a new way to install brushes, which is explained at the last of the PDF, but is explained better in the video on this page. https://skipallenpaints.com/2012/02/28/corel-painter-12-1-brush-management-a-primer/. Please watch this video and see if it helps you. If not, then let me know, and we will try to work it out together. Again, so sorry for the delay in response. I am so grateful to you for all your help. I am a newcomer to Painter 12…my tablet hasn’t even arrived yet, but I have been playing with painting with a mouse. Last night I downloaded your Cool Spring brush library and evidently didn’t know what I was doing. I thought I would be asked where to put it (fas I had when downloading new categories or variants) but it went directly to Painter and…now ALL the Painter brushes are gone and only Cool Spring brushes are there. How can I get the Painter Brushes to appear again? My ability to absorb maxed out on reading the above information. Please tell me it’s easy! Open your brush selector and on the far right corner of the opened window, click on the option button/flyout menu. A list will open. Look down the list for Brush Library. Click Brush Library and three libraries will be in the opened list. In your case it will be Painter Brushes, Painter 11 Brushes, and Cool Spring. Double click Painter Brushes and that will take you back to your default brushes. Hope this helps. Let me know if you have more trouble. You are the greatest! I had stumbled upon the solution prior to receiving this but had since forgotten how I did it and sure appreciate the explanation. I’ll file your response for future memory lapses. Love your work and your willingness to share. HI Skip, I am relatively new to Corel and struggling with loading Brushes. I am updated to Corel 12.2 and I looked at both paths you discuss. I found that on my Mac under Library/application Support I have no Corel folder. Now what? If you want to learn about the paths and wish more info…then please let me know. But first…the video will show you how to install the brushes without the need to find the paths. Skip, thanks so much for your .pdf on brush management. Things are now making sense. I have one question, which I hesitated to ask, but I can’t find a logical answer. How do I create a New Brush Library, as a starting point to organize my brushes? I guess that I could duplicate one, empty it, and then use that to put my new brushes into? For some reason, we do not have an easy way to create a new library. If you create a library with one of my sets, then you have a library that you can add the rest of your brushes as a category. In other words, say you download Bristly Dabs.brushlibrary. Double click it and load it in Painter…it will be a library called Bristly Dabs. Now you can download Buttery Oils.brushcategory and load it into your Bristly Dabs library. Don’t put too may categories in one library, it can slow your brushes. If you want to name your library something else, then Export your library and when you get to the save window, change the name of the file, but leave the .brushlibrary extension as is. I think it is easier to go to Brushes > Import or Export Variant, Category or Library…rather than do the double click method. Did you watch the video Brush Management in Painter 12.1 a Primer? It will explain a lot and it is the same for Painter 12.2. Basically, the “Cool Spring Download” is the file to be used for the old method of loading. These brushes were done prior to Painter 12.2. You want to click on Cool Spring Library or Cool Spring Category, which are two different downloads. Cool Spring Library will create a library with Cool Springs loaded in the library. Cool Spring Category will install in the currently active Library. I do not believe that you will have any trouble with Window’s 8. I have it loaded on my lab top; I haven’t had any trouble so far. I think if you watch the video linked above, it will answer your questions. Watched your video, copied brush library to brushes folder in Corel, library is listed under brush library, however when I click on that library, no brushes are loaded. Thanks for your reply. 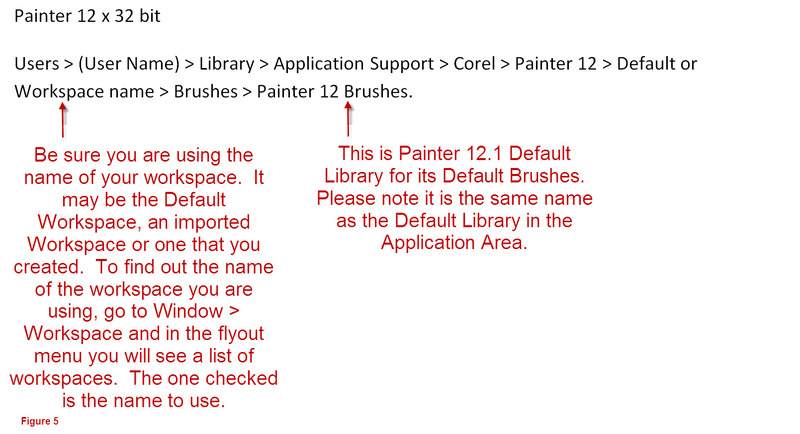 Before I explain anything, please open Painter and go to Help > About Corel Painter 12. When the window opens, look in the middle left of the window for a group of numbers. You should see 12.2.1.1212. If you do not have those numbers, the do go to the Corel website and download the updates that you need. If your find you are up to date, then follow this. You said, “copied brush library to brushes folder in Corel.” Coping anything to the brushes folder whether in the Applications area or the User area will not work using the files called Cool Spring.brushlibrary. 1. Open Painter and create a new document of any size. 2. Go to the menu bar and select Brushes > Import > Library. 4. Select Cool Spring.brushlibrary and click on Open. 5. The Cool Spring library will be automatically loaded in the proper place and you should be able to access by going to the Brush Selector drawer and clicking on the option button. Look down the list for Brush Library and select it. A new list opens and should have all the available libraries. Cool Spring should be one of them. Select it and now you should be able to see the variants in the Cool Spring library which contains the Cool Spring Category. Mitch…I don’t want to give up. I really want to find out what is happening. Do you have time to meet with me on a Go To Meeting and figure out what is happening. If yes, just give me some times you may be available. Of course, if you are really done, I understand. Sorry you are having so much trouble. Skip, Yes I would like to figure this out. I’m available Monday and Tuesday, late morning or early afternoon. Mitch…Let’s shoot for 11:00 AM Eastern time. Will that work for you. I’ll send you a private link if that time is acceptable. If you are in a different time zone, please let me know which one and I’ll meet you anytime on Tuesday. Yes sounds good, looking forward to it. Link has been sent to your email address. See you in the morning. I’ve read through a number of your articles and watched most of your videos and have even been successful in downloading a few of your brush sets. My question is this: I’m interested in download a couple of Karen Bonaker’s brush sets, however when I click on the download button, the message asks me to “save as” and I have saved it in the Painter Brushes 12 folder with Painter 12. I go to the folder and see the file name (not highlighted so I can click on it), nor is there a companion jpeg. I’m very much a newbie, so please excuse the dumbness, but I’ve run into a wall and can’t figure my way out of this one. Any help would be greatly appreciated. When you download any brush set and you do it as a save as, you do not want to save it in Painter Brushes 12 folder or anywhere that Painter goes to access brushes. All you have done is saved a “dead” file inside of Painter 12. Instead, you want to save the file somewhere on your computer; I have a folder in my documents called Custom Painter Stuff and I save all my custom stuff there. Once the file is saved on your computer, you can now install the brushes, which you haven’t done. The installation process will put the brushes into Painter in the proper place. Just to be sure, Karen’s files look like this “Karen’s Named Brushes”.brushlibrary. Or “Karen’s Named Brushes”.brushcategory. Now you can double click the .brushlibrary file and the variants will load as a brush library. Or double click the .brushcategory and it will install directly into the currently active/open library. 4. Tried loading a Brush Library, Chapter 1 was there but no brushes showed up. Sorry for the delay in answering. I had a total knee replacement on the day you posted this note. Back home now. If you placed the brushes in the path you described, they wouldn’t be in your roaming data folder. I really need to know what version of Painter that you are using. Once I have the information, I can help you. Don has provided his brushes correctly and in a format that is easy to install. But, one thing I think you are missing is adding the companion jpg. When you take the brush folder and place it in the path, you also need to put in the the jpg provided that has the same name as the folder. I wouldn’t use the path that you are showing in your question; as soon as I know your Painter Version, I can tell you what the path should be. I read your whole document about brush libraries, brushes, moving them etc… I still however cannot figure out how I can create a brush library in any of my painter programs. (I am currently using Painter 2015). I have been led to you for a different reason and realized that I cannot create my own brush library. I can open, import and save brushes to libraries that have already been created. I just posted this reply with answers to your other questions. But I thought I would post the pertinent information to this question here. Thank you – I actually figured this out almost right before I saw this post. I cannot believe Painter doesn’t make it easy to create a library. Every instruction book tells you that you can make and create brushes – however the simplicity of creating a folder in the program and saving your brush is just not there. I am not sure but I now think that if I want to create a brush library – I really cannot do that – however the way to do that is to “export” an existing library, rename it – then “import” it back – add what ever brushes you want or hide the brushes or categories you don’t. Is this correct? Thank you Skip for your generous sharing of information.